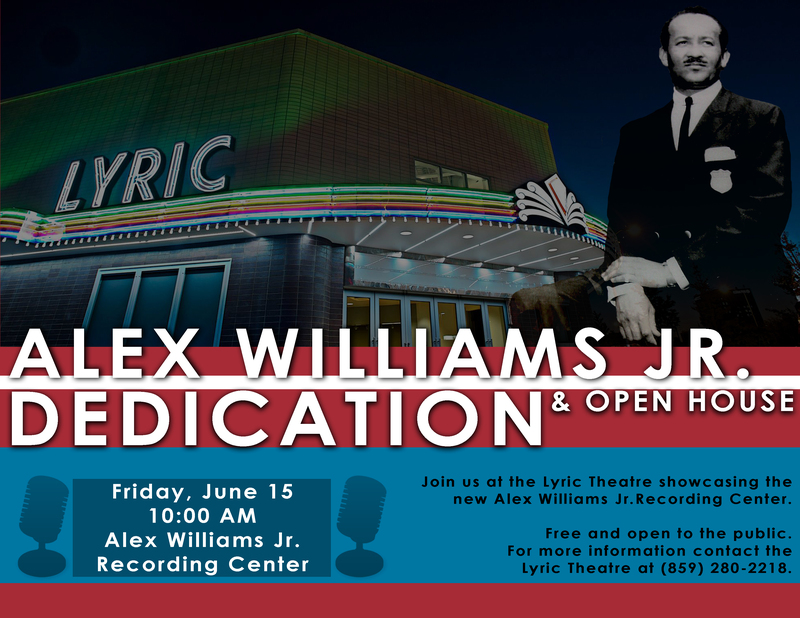 With the official opening of the Alex Williams Jr. Recording Center, The Lyric Theatre wants to hear from you about the Lyric Theatre in the 1940s to now, the East End Neighborhood, Alex Williams Jr. and Lexington Kentucky. If you have any stories pertaining to this, we would like to extend to you an invitation to speak and be recorded in the Alex Williams Jr. Recording Center. Our mission is to preserve, promote, present and celebrate diverse cultures with a special emphasis on African-American culture. Every day we are losing these beloved stories and we want the world to know about them all. We will be scheduling 30 minute recording sessions on Tuesdays from 11:00 AM - 2:00 PM in the new Alex Williams Jr. Recording Center located inside the historic Lyric Theatre. If you are interested in sharing your story please fill out the form below, call us at (859) 280-2201, or visit us at 300 E. Third Street to schedule an appointment. Friday, June 15 at 10 am the Lyric Theatre and Cultural Arts Center and Lexington Community Radio are pleased to officially open the Alex Williams Jr. Recording Center. This event is free and open to the public. The Lyric Theatre will be dedicating their brand new Recording Center to local Lexington Broadcaster Alex Williams Jr. The Alex Williams Jr. Recording Center will be the beacon for the Lyric Theatre's oral history projects that involve the East End Community, the Lyric Theatre itself, and connections to Alex Williams Jr.